A healthy maple tree offers beautiful shade all summer and a riot of vibrant colors in the fall. But often maple trees can suddenly begin to show signs of decline. Good soil is a vitally important part of keeping a maple tree healthy. Adding mycorrhizal fungi to the soil around your maple tree will improve the absorption of nutrients, moisture and minerals. Keeping the root system performing at optimum levels will keep your maple tree healthy and vibrant for many years. 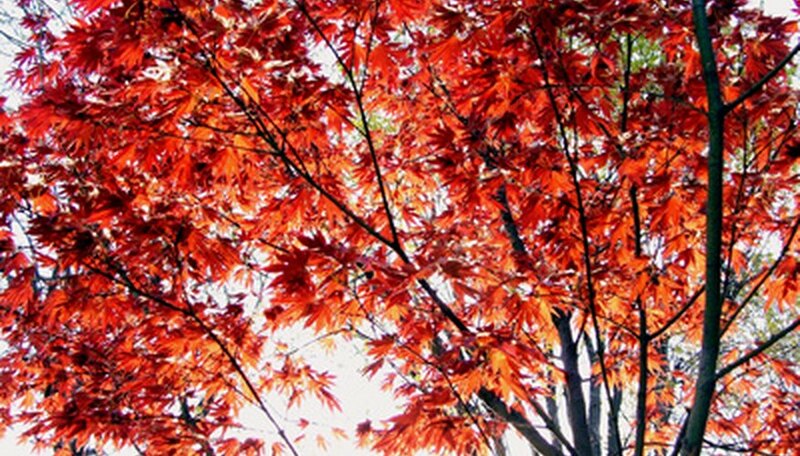 Plant your maple tree in an area that gets full sun. Maple trees like moist soil with good drainage. Some varieties can withstand heavier soil and periods of drought, but most need consistent moisture. Drill three to six holes around the root system of your maple tree using a soil auger. The holes should be 1 to 4 feet deep depending on the size of your tree. Small, newly planted saplings need shallower holes while fully mature trees need deeper holes. Pour mycorrhizal fungi into each hole. Check the instructions of the package for guidelines on how much to use based on the size of your tree. Water the area so that the soil is damp all around the tree to a depth of 1 to 3 feet depending on the depth of your fungi application. Construct a trellis around young saplings to protect them from high winds and passing animals. Saplings are vulnerable until they get established. Prune in the winter when the tree is dormant. Take off dead or dying limbs and remove limbs that are touching or crossing. Use sharp pruning shears for the smaller branches and a tree saw for the larger, tougher limbs. After the first application of mycorrhizal fungi, watch the health of your tree for 6 months to 1 year. Signs of stress such as yellowing leaves, poor leaf development and stunted growth will disappear as the tree regains health. If these symptoms persist, apply a second application. Mycorrhizal fungi can be added to the root system of healthy trees to improve their development and longevity. Before planting a maple tree, add mycorrhizal fungi to the soil. This will establish a good growing environment right from the start of the tree's life. Maple trees have a deep taproot that absorbs moisture in the ground. Mature trees will only need watering during periods of extreme drought. Keep the soil around a young sapling moist until it reaches maturity. Keep the area around your maple tree's root system clear of concrete surfaces such as driveways and patios. Concrete prevents air and moisture from penetrating the soil and will compact the soil, leaving the roots starved for air and room. University of Minnesota:Forest Fungi…one of the best kept secrets?